err "DATA declaration address is below MEM_BOTTOM"
These macros make simple framework to manage internal RAM of x51 MCU. The idea is in defining RAM areas: The stack is placed above flags area (bit-addressable locations), free memory is limited with ram top (7Fh) and ram bottom (top of the stack). Implicit allocation gives some insurance of not overlapping of data with checking for crossing boundaries, if there is an insufficiency of resources the warning will be flagged - then some rearrangement can be performed. keep in mind that this selection does not preserve previous bank settings, so, PUSH PSW/POP PSW in procedure must be present to restore bank on return. Well, you could also use "VIRTUAL ScratchPad" + "END VIRTUAL" directly, I think it could also look good. , it can be used alternatively (both variants can not be used simultaneusly I think). What about flags - I would prefer separate flag declaration like I did, but maybe somebody else may like your variant. 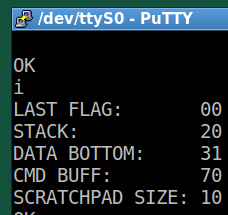 The main difference in logic is calculating of DATA_BOTTOM: DATA_BOTTOM is similar to STACK with STACK_SIZE offset, but STACK now is LAST_FLAG_ADDR, so, bit-addresable bytes unused for flags are now wasted, stack is shifted in their area and area for data is increasing. It looks as it works, but there is a problem appeared: it does not work with listing macro :S Thus, I've got some proofs through monitor program (see picture). ; Clock stretching by slave is not implemented! ; Delay set to provide ~50kHz smbus clock at 24MHz main clock. ; go below 10kHz smbus clock! To make it perfect there should be checking bus for deadlock or no acknolegement by slave, but this code can be easely extended.